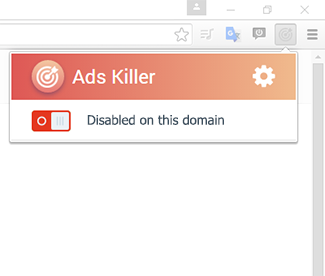 Ads Killer is an extension available for Google Chrome, Orbitum, Yandex Browser (in development), Mozilla Firefox (in development), Opera (in development), Edge (in development). Its main goal is to remove all obstructive ads when browsing the web: banners, all kinds of pop-up windows and different background advertising as well. How does Ads Killer work? 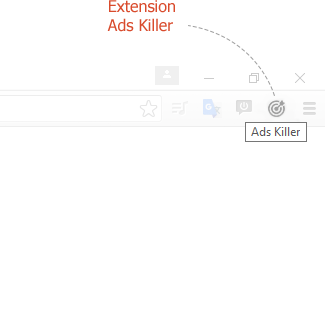 When downloading web pages, Ads Killer checks all the elements therein (banners, text, images) and compares them with filter lists. 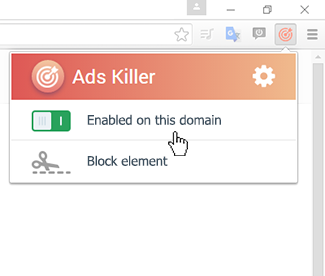 These lists are a set of "rules" that indicate to Ads Killer which elements you want to block. 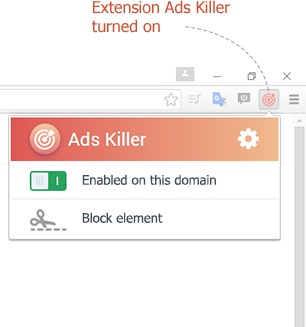 With Ads Killer you do not need to worry about the lists and rules - they are updated automatically according to the user's region. Yes, Ads Killer passed all tests for extensions in the official stores (Chrome, Opera, Firefox) - that means that there are no viruses, trojans and other malicious software. Also, personal user's data (passwords, conversations, etc.) is not collected. How to start using Ads Killer? Download the extension from this site or from your browser extensions store. After the extension is installed, in the upper right corner of the browser (if you have Google Chrome) a new icon will appear in the form of a target. Go to any website and you will notice that the icon turns red - it means that Ads Killer works and blocks ads on the page! How to turn off ads blocking on a particular site? Click on the Ads Killer icon and select «Turned On on this web-site ». The heading will change to «Turned Off on this web-site». 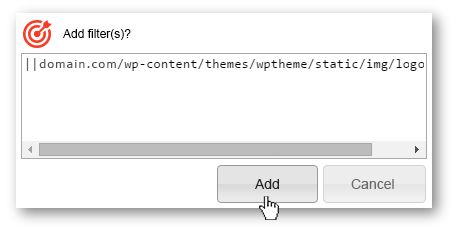 Then click «Update» and wait for the page to reload. The color of the extension icon will change to grey. Now, advertising will not be blocked on this web-site. If you want, you can turn on blocking by repeating the steps mentioned above. How to block a banner by yourself? 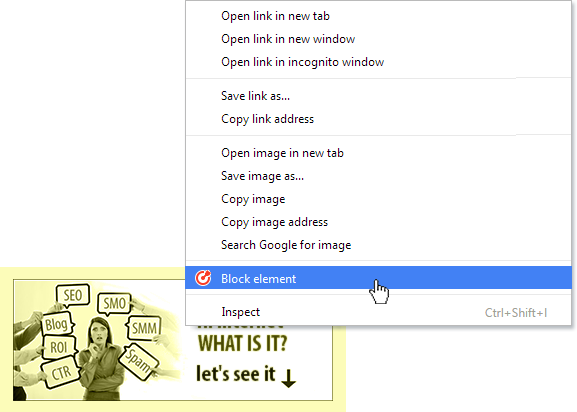 Click on the Ads Killer icon and select «Block element». Point your mouse on the banner, click the left button. In the window that appears, click «Add». How to open the extension settings? Click on the extension icon and click on the "gear" icon in the window that appears. 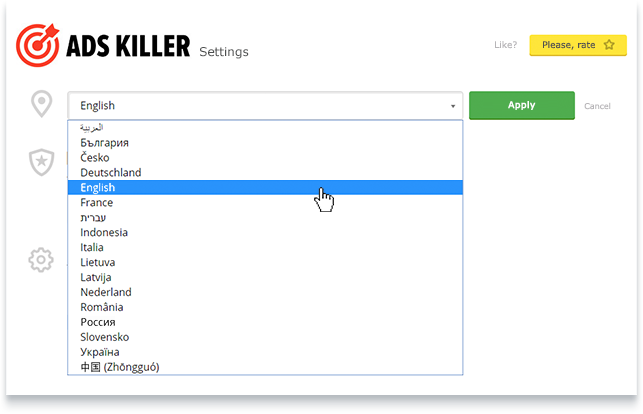 How to change the region in Ads Killer? 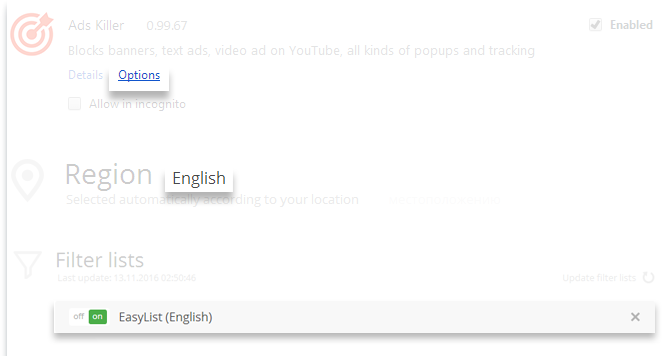 Ads Killer automatically installs necessary filters depending on the user's language and region. You can change this setting by going to the extension settings and selecting the desired region from the list. Then click «Apply». What is a "Whitelist" and how to add the site to it? All sites for which ads block should not work are included into this list. There are 2 ways to add sites to the list. Click on the Ads Killer icon and disable blocking. This site will get to the white list. The site can be added manually in the Ads Killer settings. In the «whitelist sites»section click « Add site» and enter a name (for example vk.com). Then click «Add a domain». Typing https:// or http:// before a site URL is not necessary. How can I add/remove filter lists? 1. In the Ads Killer settings, click on "Show advanced settings"
2. In the «Filter List» section any filter can be removed or added. To remove - click «X», to add - click on the «+» icon and select the desired filter from the list. Then confirm by pressing «Add a filter». Please note that it is better not to remove the filter, loaded by default for the selected region. If you accidentally delete it, then you can re-select the region or select the appropriate filter from the list. 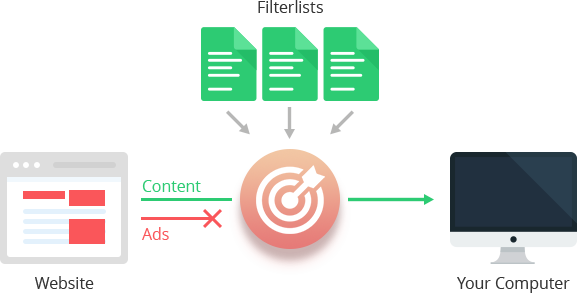 Also it is better not to add too many filter lists to Ads Killer. It will slow adblocker performance and therefore the browser. Can I add my own blocking rules? Yes, it can be done in the advanced settings, in the «Custom Filters»section. For more information about creating your own filters, you can read here - https://adblockplus.org/ru/filters. For what the option "Allow non-intrusive advertising" is needed? Many websites can not exist without advertising. In addition to this, not all advertising is obstructive and interfere with comfortable viewing and usage of a site. 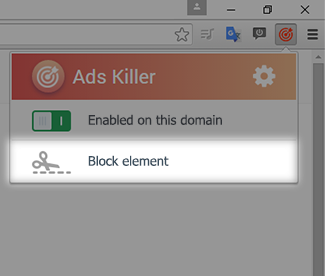 By default, Ads Killer allows some unobstructive and useful ads. You can always turn this option off and block all ads on any page. To do this, go to the «Additional rules» section and uncheck the «Allow non-intrusive advertising» item. I accidentally blocked an important element of the site. How to unblock it? Let's say you accidentally blocked the lifehacker.ru site logo and want to unblock it. To do this, go to the «Settings» >> «Custom Filters».Select the filter in the list, which appears in the title of the lifehacker.ru site name and click «Remove filter». Make sure that the item is appeared on the site after this. I have installed Ads Killer and still see ads. Why? Open the Chrome menu ,and select «Turned On on this web-site ». The heading will change to «Turned Off on this web-site». Then click «Update» and wait for the page to reload. The color of the extension icon will change to grey. Now, advertising will not be blocked on this web-site. If you want, you can turn on blocking by repeating the steps mentioned above. Open the Chrome menu , select «More tools» >> «Extensions». 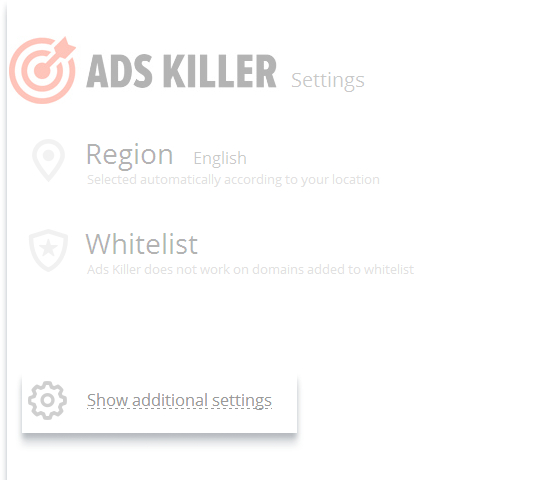 Find Ads Killer in a list, select «Options». Make sure that selected Region is correct. 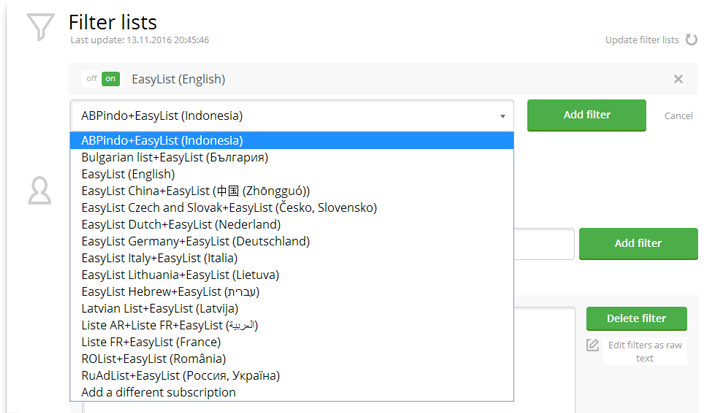 Regional filterlist must be enabled. Press«Update filter lists» or restart the browser. 3. Check that the site is not in the whitelist. Open the Chrome menu , select «More tools» >> «Extensions». Find Ads Killer in a list, select «Options». Make sure the website is not in Whitelist. If you decide to block all advertising, even unobtrusive and useful, turn off the « Allow non-intrusive advertising » option. I have completed all the previous steps, but still see ads !!! 1.It happens that advertising is built into a code of a page and can not be removed without breaking the structure of the site. 3.It is also possible that advertising is built on a site by a virus, malware extension or a browser plugin. You need to check your computer with antivirus and remove suspicious browser extensions and plugins. Please email us if the advertisement is not removed from the website after all your attempts. We will definitely check and solve this problem. My question is not listed here, where can I get additional help for Ads Killer?